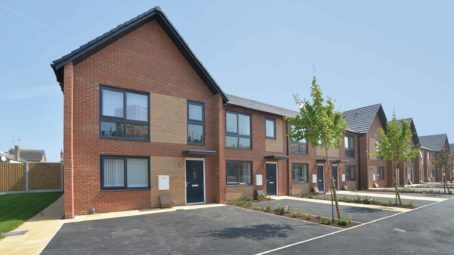 The first affordable housing scheme under Flintshire County Council’s ‘SHARP’ programme has been successfully completed. The site, located at the former Custom House Lane School, Connah’s Quay, consists of 12 no. 2 and 3 bed dwellings and is the first of a number of schemes within the region under the programme to be delivered which will ultimately provide 500 new homes by 2020. The Custom House scheme featured in a recent online BBC News article outlining the council’s steps towards providing affordable housing to address the growing demand within the country. 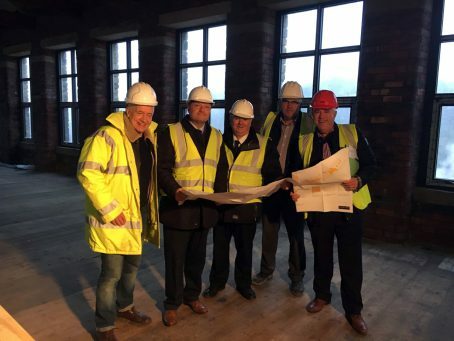 Local MP for Colne Valley, Jason McCartney (second from left), recently joined Halliday Clark Director, David Halliday (far right) for a tour of the ongoing Globe Mills project in Slaithwaite. Halliday Clark are providing design services for the extensive multi-million pound restoration of the historic mill buildings, ultimately providing home to the University of Huddersfield Innovation Hub together with commercial and retail units and is intended to provide hundreds of jobs to the local population, aided by a £2.9m investment from the Government via the Local Enterprise Partnership’s Business Growth fund.